HMS Abdiel, a newly built fast minelayer, joined the Grand Fleet in early 1916. Soon after the main battle commenced, Abdiel took up her station close to Jellicoe’s flagship. the Iron Duke. The ship, with a full load of mines, was effectively a floating bomb which could easily have been detonated by a single enemy shell whilst their own 4inch guns did not have the range to participate in the fleet action. However, the Abdiel remained unscathed and the main action was broken off at about 21:00 when the German fleet began to retire towards its base at Wilhelmshaven. HMS Abdiel’s flag at Lawford. 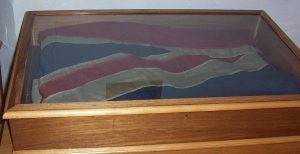 The Battle Ensign flown by the minelayer HMS Abdiel at the Battle of Jutland (which normally would have flown from the foremast or mainmast) was left at St Mary’s Church, Lawford by her captain, Commander Berwick Curtis. Originally it was on public display but it seems to have been removed and stored in the Church away from public display in recent years. (Kindly submitted by David MacDonald and based on his account).